BETTER PRODUCTION HOLE TAPPING That said, the plate-machining job presented a challenge. The shop's CNC mill did not have ade- quate Z-axis travel to handle the thickness of the plates or the ability to tap holes all the way around the parts, so using it to perform the tap- ping operations was not an option. Mr. Little also did not want to risk break- ing a tap in one of the holes or cross-threading the 1 / 4 -inch-thick, 14-inch-tall 6061-T6 aluminum plates, which cost $1,000 each. Because of the di…culty of the job and the tight turnaround, Mr. Little had little time to consider solutions. 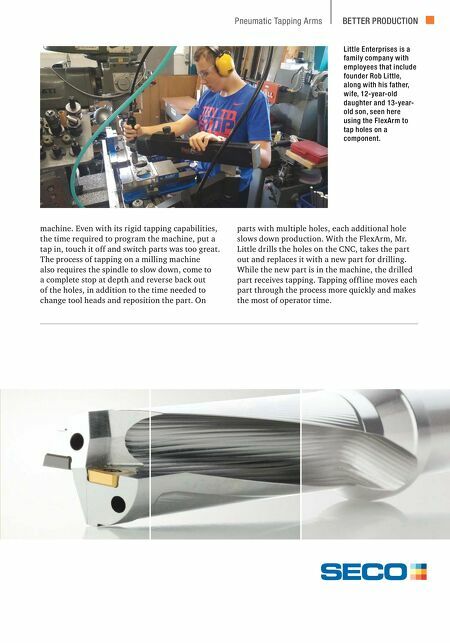 The Tapping Arm's Advantages Over a CNC Milling Machine Mr. Little remembered seeing a video on Face- book of a pneumatic tapping arm from FlexArm, a manufacturer of drilling and tapping solutions. He put a call into the company and ordered an A32 model. FlexArm's pneumatic arms are specifically designed for fast and easy tapping. With adjust- able gas-counter-balanced springs, operators can simply position the tap over a hole and execute the tapping operations. The FlexArm can also be adjusted to stay where it is positioned or automati- cally return to the home (folded) position. The tap head is always at 90 degrees to ensure accurate threading with the Helicoil inserts. The FlexArm counterbalances the weight of the motor and absorbs the torque created by the tool to reduce fatigue and the risk of operator injury. A quick-change chuck enables operators to quickly change tap sizes without changing gears, head height or stops. When the FlexArm arrived, Mr. Little wasted no time. He set up the parts in Kurt vises and had his 13-year-old son do the tapping while he filmed it to make his own Facebook video. "The FlexArm is not considered hazardous manufac- turing equipment under Fair Labor Standards Act (FLSA) definitions, and my son loves using it," he says. Now that Little Enterprises has a tapping arm, it does not need to program tapping into its CNC SOCIAL BUTTERFLY Check out these expert tips for using social media to engage with customers and establish identity like Little Enterprises: gbm.media/7tips. BE THE BOSS. Manage chips like you own the place with the new, enhanced Perfomax ® drill. A new drill geometry controls chip formation, while a special "anti-friction" wave pattern evacuates them with speed and effi ciency. 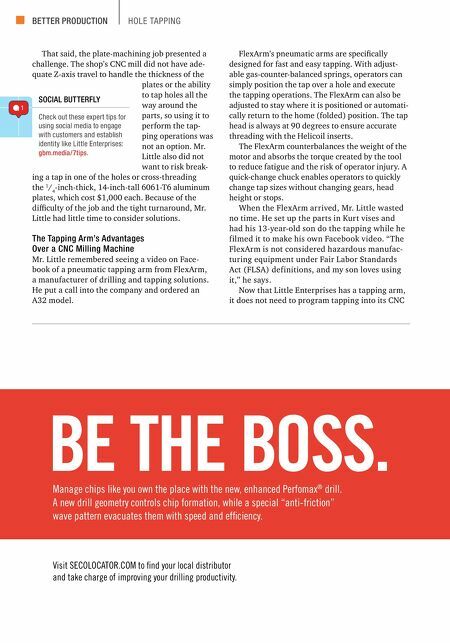 Visit SECOLOCATOR.COM to fi nd your local distributor and take charge of improving your drilling productivity.